This option allows you to enter the sender's email address, name, SMTP mail server and the user login information so that you may not need to input it every time when you need to send emails and email-to-faxs. You need not to set up your own SMTP outbound email server. What you need to do is to enter your ISP's (Internet Service Provider's) SMTP mail server information. 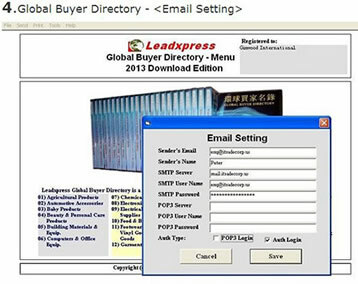 This step is similar to the setup of the other email programs such as Ms Outlook Express. It is simple and easy to complete. It is the one time process. 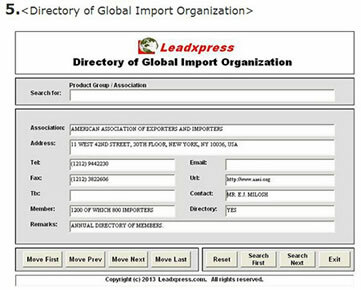 On the (Directory of Global Import Organization) screen, you may search and view information of the global importers' organizations using product group or the name of the organization. The result will return association's name, its address, telephone, fax no, telex no, email address, web site address, contact person, nos of members, directory availability, and remarks, etc. You may use this directory to contact importers' organizations to get more importers and market information for your products.